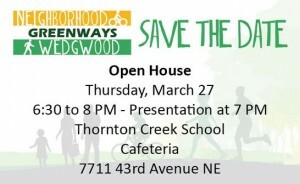 The Seattle Department of Transportation is planning an extension of the 39th Ave NE Greenway north of NE 77th St, past Thornton Creek Elementary School, and towards Our Lady of the Lake (the exact route is to be determined). Greenways are roads that are designed to be safer for pedestrians and bicycles. Cars are not prohibited on greenways. The existing 39th Ave NE Greenway was constructed thanks to funding from Children’s Hospital and opened in October 2012. According to one month of data (Jan 2014), the existing 39th Ave NE Greenway saw about 5,000 bike trips, according to City data crunched by the Seattle Bike Blog! The NE Seattle Greenways group, part of the Seattle Neighborhood Greenways Group, has met numerous times to identify potential greenway routes through NE Seattle and connected to other neighborhoods, creating a City-wide network of safer roads for pedestrians and bicycles. The funding for this greenway extension is funded through the Bridging the Gap Levy.